NACA provides advocacy for attorneys who represent consumers and their issues. The website was a stable Drupal 6 build that was ready for an upgrade to Drupal 7. The site needed both a visual and architectural refresh to make it appealing to both the membership and the public in search of assistance. At the same time as the redesign, NACA became one of the first clients of Impexium, a cloud-based association management system (AMS). Our job was to provide the best possible experience for users of both the web and AMS platforms to find content, locate attorneys, and manage personal information. SoH upgraded the website from Drupal 6 to Drupal 7. 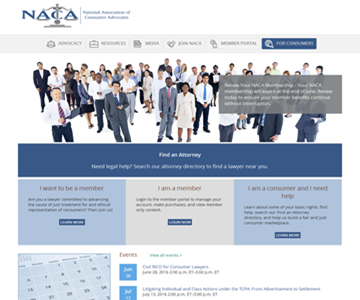 This allowed NACA to retain all their existing content and functionality. We simultaneously conducted a discovery process with the NACA staff. We examined audience needs and organizational goals, conducted a content review, and led exercises to redesign the site architecture. These activities resulted in a new menu system, home page, and page layouts. Most importantly, the architecture was redesigned around the organization's vocabulary, creating taxonomy-driven pages of content that bring together multiple types of content into usable focus area pages. SoH also completed the first Drupal/Impexium integration. We provided single sign on (SSO) so that account holders can manage their profiles, register for events, and purchase webinars. In addition, members with an account have additional access to premium content housed directly on the website. The Impexium database also drives the Find An Attorney function, a key requirement for providing access for consumers to locate member attorneys to assist them in the focus area and state of interest.